Navigate to the Writer Directory, review writer profiles message writers that you like about your project. Once you find the writer you want to work on your article, you can send them a direct order. Alternatively you can post your article as a “Pool Order” to the Content Runner “Site Wide Favorite” writers and first come first serve one of them can pick it up and start working on your article immediately. The following tutorial will illustrate step-by-step instructions for option #1 above, perusing the Writer Directory and assigning a writer a direct order. In addition, this guide will also be an introduction to creating a new User account. The tutorial will walk through the process of creating a User account, loading funds, and finally, placing direct Order. 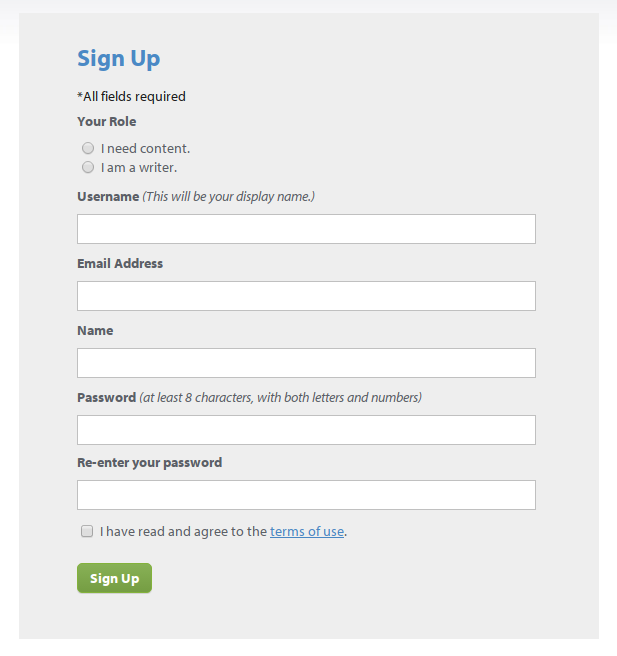 The first step for anyone looking to request content is creating a User account. From the Content Runner homepage, select Sign Up on the top right hand corner of the page. From the Sign Up page, you will select the “I Need Content” option and fill out your desired username; email where you would like to receive notifications; and password for your account. Once you have submitted your information, you will receive an email from Content Runner asking you to confirm your account. Select the email instructing you to confirm your account. 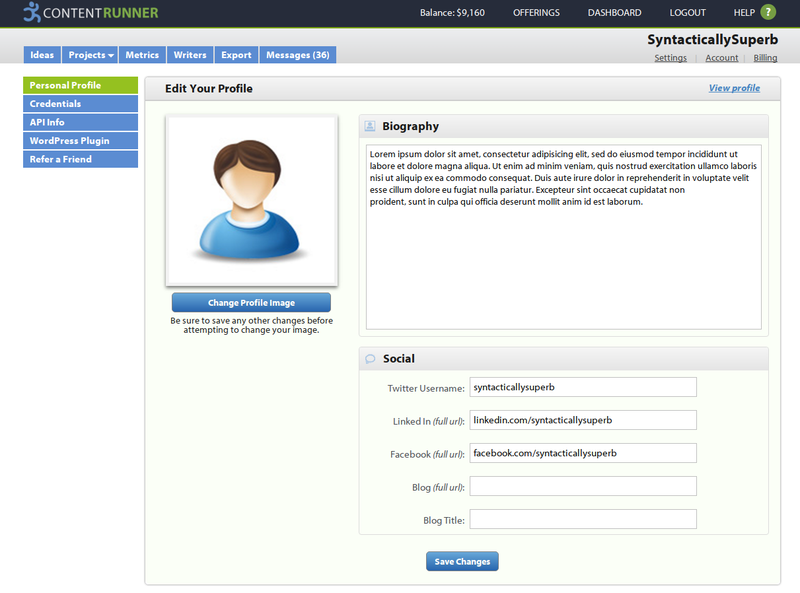 Once you have clicked the link, you will be redirected to Content Runner where you can begin using your account. Once you have confirmed your account, you will be ready to set up your personal information. The sign up form will direct you to your Dashboard where you can post orders and access your Settings, Billing, and Account Information (the links over on the top right hand side). After selecting “Account” from your Dashboard you can add personal information to your profile, your picture, bio and social information. 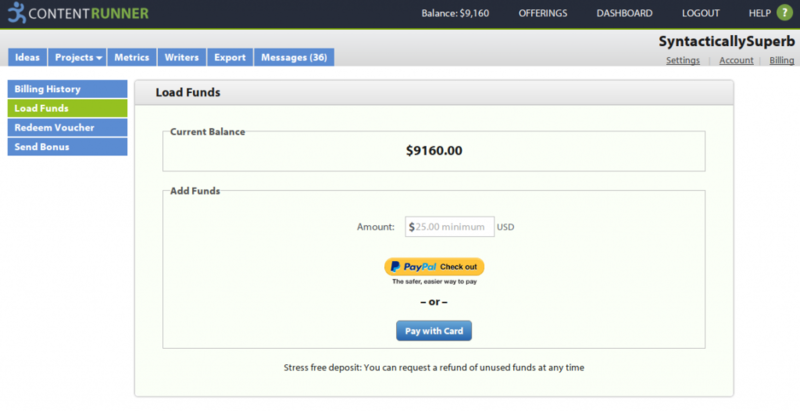 Your account balance is shown at the very top of Content Runner whenever you are logged in. To place an order on Content Runner you must have enough money in your account. Simply click on your balance to start loading funds. Content Runner will escrow the money in your order and the funds will only be released when the order is marked complete, if you reject the content (this rarely happens) the money will be returned to your account. After you load funds, your updated balance will be reflected on the page. Now that you have loaded money into your account, you are ready to place your order. 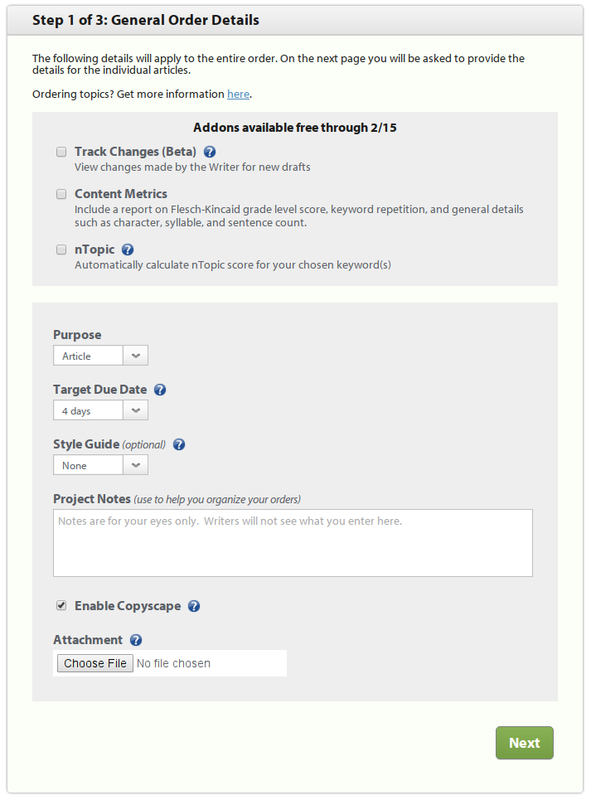 Track Changes – when you make revision request on your content you can view highlighted updates. Content Metrics – get details on grade level scores, keyword repetition, syllable count and much more. nTopic – this is a 3rd party tool for grading content relevancy based on your chosen keyword. Style Guide: Select a style guide to create structure for the look and consistency of the content you order. Choose an existing style guide or create your own here. Project Notes: Information about your project to organize your orders, THIS IS FOR YOUR EYES ONLY, WRITERS CAN’T SEE THIS FIELD. Enable Copyscape: Copyscape is a 3rd party service that scans the web to see if content created by your writer already exists somewhere else on the web. You will receive a Copyscape score for each article in your dashboard, it will show up as a “C” to the far right of each article. Attachment: add an attachment to your order if you have supporting documentation you want your writer to view. After you have completed all of the fields in Step 1, click the green “Next” button below to proceed to Step 2. 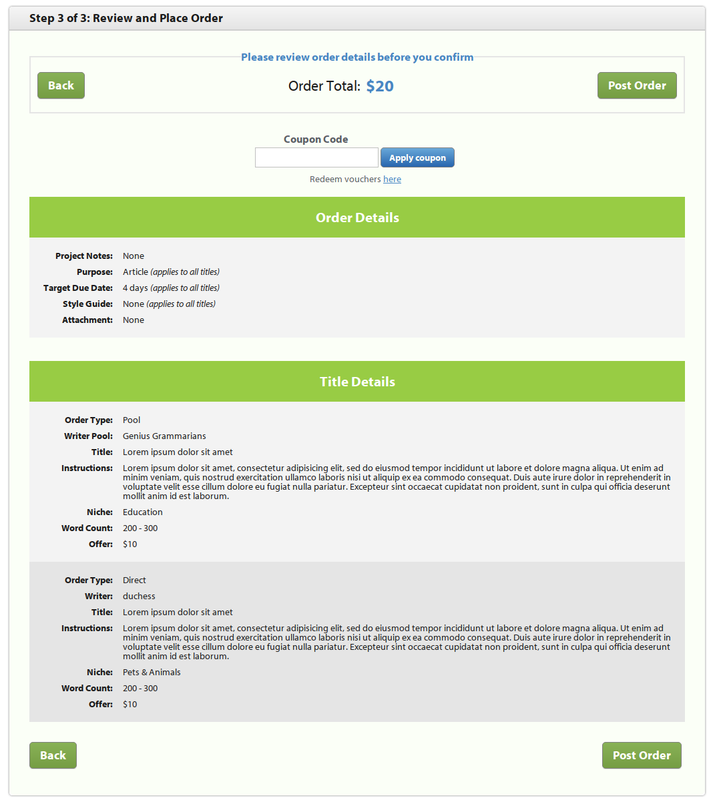 On Step 2 you will input information about each of the pieces of content that you want to order. You can either fill out the form (the default option) or select the blue “Upload” tab to download the CSV template and submit bulk orders. For this tutorial we are going to walk through the Form, if you choose the “Upload” option and have questions about the CSV please send us an email. Order Type: there are 4 orders types: writer pool, direct, open and contact orders. Direct and pool orders are the 2 most common orders and are covered by this tutorial. Contact orders are for large dollar projects and allow writers to pitch you on their capabilities. Open orders are for large volume projects (product descriptions for example) where any writer can pick up the work and start on it immediately. Word Count: select the minimum and maximum, many articles are between 500 and 600 words, but this is completely up to you. Price: We find that many articles on Content Runner that are between 500 and 600 words are priced between $20 and $50 depending on the vertical, the writer you choose and the amount of research required. Pricing can vary quite a bit, there are small dollar projects for product descriptions and are white papers that are priced at $500 and up, pricing is up to you to choose. Title: The topic you want written. Article Instructions: Provide detailed instructions for the writer and be very specific. Without question we find that the Users that put time into creating detailed instructions get back much better content than Users that only provide 1 or 2 sentences of instructions. Also include sample URL’s of content you like (for inspiration) or places for your writer to do research. Niche: Select the vertical for your content, this is important for the writers to see and later on for content metrics as we sort all the content by vertical and create detailed reports for you. You can also use the Price Calculator on the right hand side to come up with a good idea of the price you should set for your content. 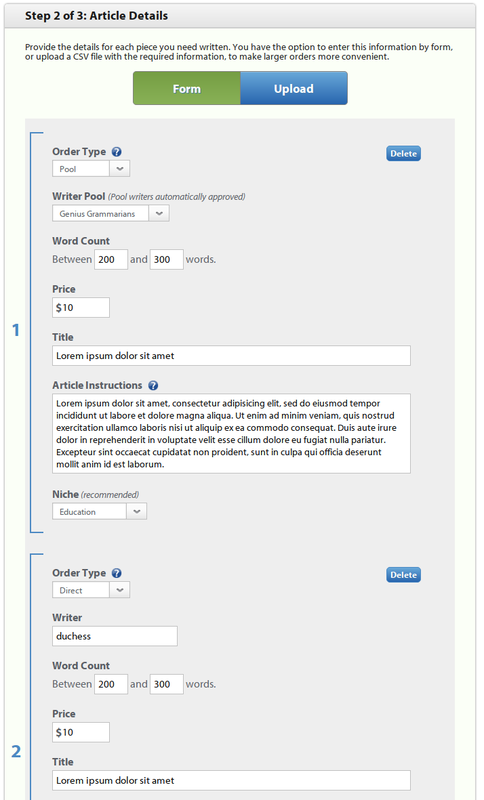 After you have completed the details for your first article, you can add additional articles to your order by clicking the blue “Add Title” button. When you have loaded up your article details then click the “Next” button to proceed to Step 3 of the Order form. The final step of the order process is to review and confirm your order details. At the very top of the page will be your Order Total and below that you can find your Order Details as well as the Title Details for each piece of content you ordered. When you are satisfied with your order, click the “Post Order” button and your order will be complete. After you submit your order you will receive a confirmation email with the details of your order. Once you have been notified that the Writer you selected has been assigned the order, the process is then complete. If you have additional questions regarding how to sign up for an account, or how to place a Contact Order, you can email us at support@contentrunner.com.